Recently our Technical Director Andy Moon was in the United States to attend a security trade fair and meet up with existing and prospective Advanced Perimeter Systems customers on the North American mainland. His trip took in the fascinating city of Philadelphia and he brought back with him a selection of photographs that exemplify the amazing history and diversity of the city. As today is the start of Thanksgiving celebrations, we felt it appropriate to share with you one of Andy's photographs of Philadelphia with both a historic and British connection. This is the famous bronze statue of William Penn on top of the City Hall. We have provided perimeter security for statues over the years such as in the gardens of Powys Castle in Wales (click here to read more) but, given its location, we would guess that this particular statue doesn't need any such protection! His clothes are instantly recognisable as being that of a Quaker so the statue has a very distinctive silhouette from a distance or down in the streets below. Andy told us how eye-catching and impressive the statue looks and that made us wonder why such a man as William Penn merit such an iconic monument? Well, reading a little about him as we did on Wikipedia's page, it became obvious. He was both a man of his time and, possibly, before his time. English by birth (born at Tower Hill, London in 1644) and the son of an Admiral, William grew up in post-Civil War England when Oliver Cromwell was ruler. Through personal and family experiences, he became a man of ideals who believed in religious freedom, democracy and peace and when he had the opportunity to go to North America he set out to make that dream a realisation. He founded the Province of Pennsylvania and became well known for brokering successful treaties with the Lenape Indians, resulting in many decades of peaceful co-existence between them and everyday Pennsylvanians. 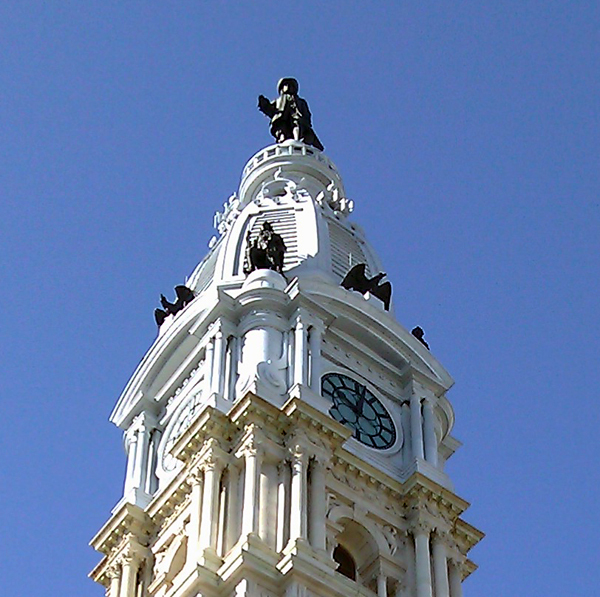 It was under the guidance of William Penn that the actual city of Philadelphia was conceived and developed. Having achieved so much in the interests of others, it seems somehow unjust and inappropriate that such a man, having returned to his native England, subsequently died penniless and was buried in an unmarked grave. In that sense, perhaps he was a man before his time but his deeds - and his statue - will live long in people's memories. On a lighter note, Andy told us a fascinating and TRUE story relating to the William Penn statue. It's referred to as the 'Curse of Billy Penn'. Up until 1987 the City Hall with the statue atop was the city's highest building and apparently there was an agreed understanding amongst the city of Philadelphia's town planners that no building would ever be built higher. However, in 1987 construction began of a skyscraper called One Liberty Place - a building that exceeded this height. Around that time the city's most notable sports teams began to endure a series of championship failures such as not had been seen before. People attributed this to a 'curse' caused by this new skyscraper now towering about the William Penn statue. Sounds crazy? Not a bit! Here's what happened ..... when a new building (Comcast Center) was being constructed and which was to become the then (and still current) tallest building in Philadelphia, a small replica of the City Hall's bronze William Penn statue was fixed to the final beam. Not long after that, the Philadelphia Phillies baseball team won the World Series! Thanks to Andy for taking the photograph and giving us a new perspective on one of America's biggest cities.